Whether pasta e fagioli — literally, pasta and beans — is an Italian soup with pasta in it or a pasta sauced with beans is a matter of proportion and preference. I like it as a soup thick with beans and pasta. The notion of two starches combining to become an Italian staple at first seems difficult to fathom. But try pasta e fagioli. This dish of modest ingredients is capable of providing great pleasure and satisfaction. Creamy beans give way to pasta’s toothsome give. Seasonings of aromatic rosemary, tangy tomato, garlic, and sometimes pancetta or prosciutto infuse the mellow beans. As they cook, the beans exude a silky broth that absorbs garnishes of green olive oil and Parmesan cheese. When I want to make soup into a one-dish dinner, I turn to pasta e fagioli. Its ingredients are easy to find or make substitutions for. Its bean-and-grain combo provides a vegetarian protein. Making it can be as easy as simmering cannellini beans with garlic, tomato, and rosemary, and then cooking a short, hollow pasta such as tubetti or macaroni in the beans. When I want vegetables, too, I serve bowlfuls with a small pile of garlicky sautéed greens on top. Kale, dandelions, or broccoli rabe are good choices. I have also added cubes of the last of the winter squash to the simmering beans, with rich results. The only deal-breaker to making a decent pasta e fagioli is that you have to begin with dried beans. There is no way around this. Only from-scratch beans get buttery and meaty, and that’s what you want for a soulful soup. If you don't have a pressure cooker to cook your beans quickly, split the project in two: cooking and freezing the beans, then defrosting and reheating the beans. I like to make a big batch of beans and then divide them among several small plastic containers ranging from 2 to 8 cups in size. In the smaller containers, frozen beans thaw quickly. When you pack the beans, add some of their cooking liquid, which seems to help them remain intact throughout the freeze/thaw cycle. Let the cooked beans cool to room temperature before covering them, to avoid condensation, and fill the containers only three-quarters full. 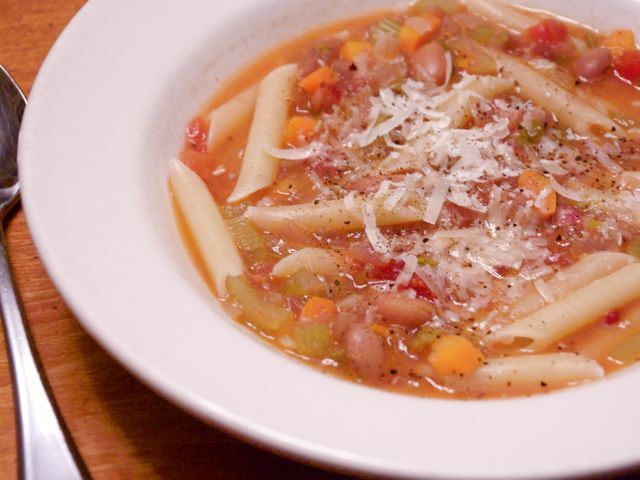 With cooked beans on hand, pasta e fagioli becomes a dish of convenience. You can quickly sauté a soffritto of onions, garlic, and parsley (and pancetta if you like), and then simmer this base and some canned plum tomatoes with the beans for a bit before adding the pasta. # Substitute freely. Italians typically use borlotti or cranberry beans, cannellini, and chickpeas. You can use any white bean including navy beans, corona beans, and, for those of us lucky to shop at the Hillsdale Farmers Market here in Portland, Ayers Creek zolfino or purgatorio beans. I regularly employ lentils and pinto beans, because they’re in stores everywhere. Next I’m going to make a pasta e fagioli of the Americas with Mexican red beans or black beans. # Use up your kitchen’s odds and ends. That last nubbin of bacon/pancetta/salami/prosciutto/ham may not seem like much, but it takes only a small amount to add depth to a soup. The same is true for Parmesan-cheese rinds, which you can throw into the beans as they simmer. (Discard the rinds before serving.) And use up those leftover small amounts of dried pasta — even spaghetti, which you can break into short lengths before cooking. # Mix it up with whole-grain pastas. I like to pair whole-wheat macaroni with lentils, and nutty farro pasta with any bean. # Purée the beans — or not. A purée of beans with pasta cooked in it seems luxurious, while leaving beans whole shows off your mastery of bean cookery. # Read Judith Barrett’s book, Fagioli, about the different forms pasta e fagioli can take, and for a glimpse into Italians’ regular and clever use of beans. Recipes range from appetizers to seafood dishes. So forget the long list of ingredients. Sometimes soup — and dinner — is as simple as pasta and beans. p(bio). Kelly Myers is a chef and writer in Portland, Oregon. She is also the co-director of Market Chefs, an organization dedicated to inspiring and teaching consumers to cook local foods.